09:30hrs: Leave Nairobi and drive South through Maasai country via Namanga on the Kenya-Tanzania border and on to Amboseli (Picnic Lunch served en-route). On arrival, settle in the camp/lodge and if time permitting proceed for a short game drive which provides a chance to see Rhino, Lions, Giraffes, Elephants and many other animals with Mt.Kilimanjaro, Africa's highest peak providing a beautiful back drop. Dinner and overnight at the camp/lodge. 06:30hrs:Proceed for an early morning pre-breakfast game drive. Return to the camp/lodge for breakfast. After breakfast proceed for a further game drive or to a camp/lodge for swimming or shower. Lunch at camp/lodge.15:30hrs:Proceed for a late afternoon game drive returning to camp/lodge for dinner and overnight. 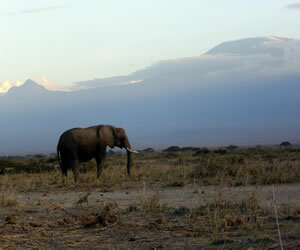 After breakfast leave the camp/lodge for the last game drive, and then depart Amboseli National Park for Nairobi. Lunch is served en-route. Arriving Nairobi in the afternoon. I feel that my life won't be complete until I go to Africa!